Belfast’s fame as a rising star in the travel industry has swept the board of tourism awards in recent years. This has meant many things for the city, not least a new appreciation for the foodie delights to be found in Belfast. Of course, most of the gourmet experiences have been enjoyed by people in Northern Ireland for years but we’re always proud to welcome newcomers to the ‘taste of Belfast’. We’ve drawn up some favourite culinary gems we know you won’t want to miss! One look at the chefs on hand to share their skills at Belfast Cookery School makes the calibre of this central attraction very clear. From award-winning culinary specialists to veterans of Michelin-starred kitchens, the team have devised a stunning schedule of events covering brunch, pasta, cocktails, Italan cuisine, French cooking and more. Individual, fully-equipped, work stations allow guests to find everything they need at their fingertips to create their own masterpiece. Much more than a just a recent tourist destination, this indoor market is a long-established part of the food scene. It’s also a meeting spot, eating place and somewhere to discover great new local products. Try a Saturday or Sunday visit to find a range of artisan traders. You can eat by trying whatever catches your eye or upstairs in a restaurant area. An eclectic range of stalls featuring everything from records to hats and jewellery to art can also be found. Yes, you’ll have to travel outside Belfast for this one but it’ll be well worth it. Hosted in the harbour of the fishing town of Kilkeel, you’ll have a chance to make your own courses and see demonstrations from a top-class chef. Oh, and will plenty of great food to taste along the way! Sawers have had over 120 years to perfect this ‘Aladdin’s cave of culinary delights’ – and it shows! This much-loved Belfast deli boasts local and international goods, luxury hampers and an outstanding selection of deli lunches. Tip: arrive early on busy days. You’ll find this iconic Belfast institution tucked away near Great Victoria Street: simply walk onto Grosvenor Road after the Grand Opera House and keep your eyes peeled! 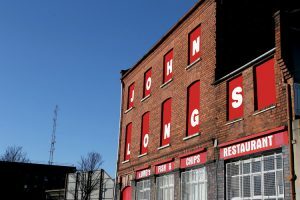 Hosted in a traditional red brick building, the John Long’s experience has remained virtually unchanged for a century. Bring a big appetite and enjoy a step back in time.